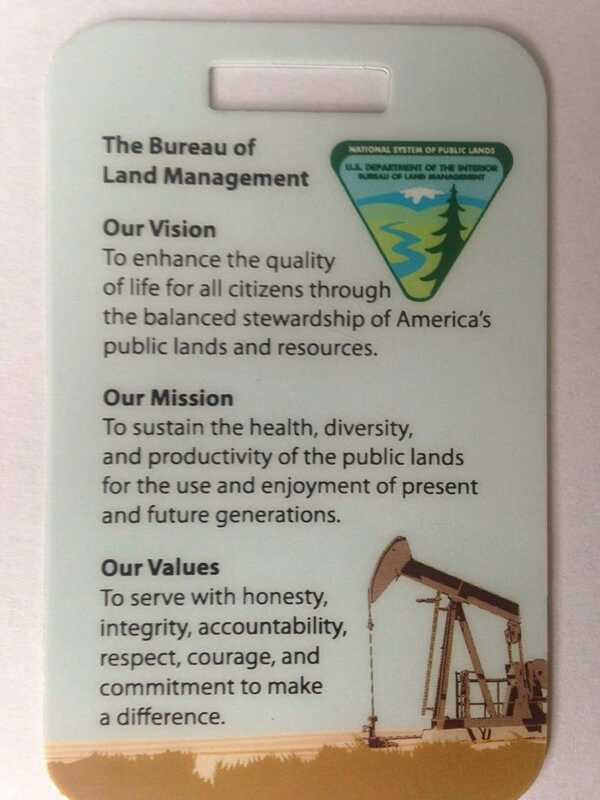 Washington, DC March 15, 2018 – U.S. Bureau of Land Management employees are now under orders to wear “Vision Cards” on their uniforms displaying official maxims, according to Public Employees for Environmental Responsibility (PEER). 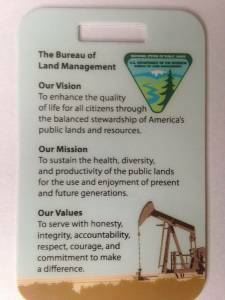 These cards are little message boards with aphoristic statements about vision, mission, values, and guiding principles of the BLM. It is not clear from where the order to wear the Vison Cards emanates. BLM has no permanent director nor has the Trump White House even named a nominee. During the past year, Interior Secretary Ryan Zinke and a small band of political appointees in DC have dictated BLM policy. While reports of the mandatory card display have reached PEER from the West, the organization is still trying to determine whether the order is national in scope. One of several ironies about the “Values” statement is that it touts employee “honesty, integrity … courage, and commitment to make a difference.” Yet these very qualities are discouraged as employees are directed to walk in lockstep, given no meaningful channels for feedback to managers, and are subject to an ex-military Cabinet Secretary who demands “loyalty to the flag” by which is meant the departmental pennant raised whenever Secretary Zinke is “in garrison” at the Main Interior Building. Back to the Bureau of Logging and Mining. Surprised were several.